Siontapina. A name may not be familiar to you. Siontapina is the name of a Sub-District in Buton District, Buton Island, Southeast Sulawesi. There are 11 villages, two of which are Labuan Diri Village and Sumber Sari Village. The distance from Baubau Municipality to Siontapina is around 72 km. It takes 2 hours using two-wheeled vehicles and four-wheeled vehicles to get here. Labuan Diri and Sumber Sari are neighboring villages. These two villages are inhabited by transmigrant residents. In Labuan Diri are mostly local transmigrants, while in Sumber Sari Village the majority of the population are transmigrants from Java. 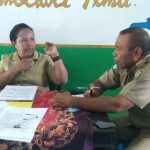 The work of the most residents of Labuan Diri and Sumber Sari are farmers. To fulfill their needs, almost all residents in these two villages plant rice and corn. And some of its citizens plant patchouli as a mainstay commodity. Patchouli is a tropical bush that produces oil called patchouli oil. The aroma of to be strong, and it has been used for centuries as fragrances and incense or clover in the eastern traditions. 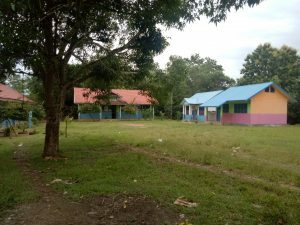 Both in Labuan Diri and at Sumber Sari several educational facilities have been built. 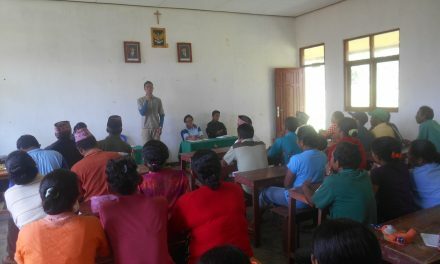 Among them are SDN 01 Sumber Sari in Sumber Sari Village and SDN 01 Labuan Diri in Labuan Diri village. In both schools, the students were dominated by farmers’ children, the Rainbow Reading Gardens were present in these area. 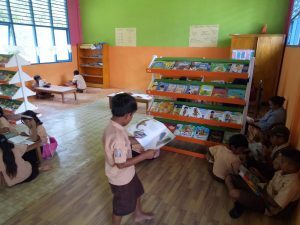 The child-friendly library at Sumber Sari and Labuan Diri are the first child-friendly libraries in Buton District. Saturday, March 2, 2019 I visited the two schools. I met and discussed with Ina Susanti, Principal of SDN 01 Sumber Sari. Santi, her nickname was happy welcome me. 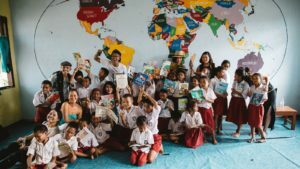 “With the presence of this library, children are increasingly diligent in reading in the library,” said Santi during a discussion. I was also introduced to several teachers at the school and new librarians, Ibu Vivi. 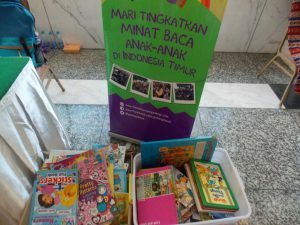 Next, accompanied by Ibu Santi, we headed to the library. Before entering, next to the door was a library rule. One of the rules is to take off shoes or outdoor sandals. Students at the school spontaneously take heir shoes off before entering the library. 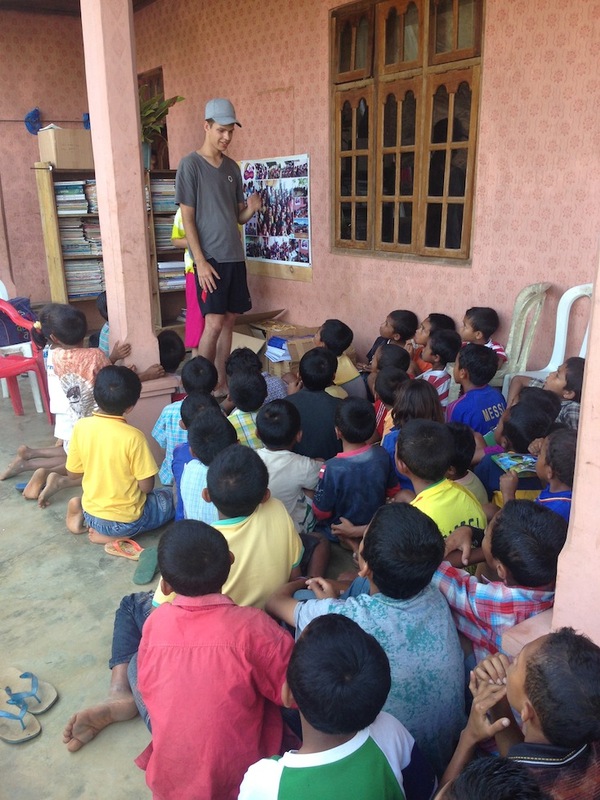 I paid attention to these children one by one. Wow, it looks simple but if done continuously, surely the children will get used to it and this habit will definitely carry on until they are adults. Iwas directed by Ibu Vivi, the librarian, to fill in the guest registry. Besides me, there is also Ibu Elisabeth Givaudan. In every corner of the room, the children look so absorbed in reading each book. Some read in the corner of the room, while some read with their friends at one table, some also chose to read on their own. It looks really fun. Books that are displayed on bookshelves are all children’s reading books, this is one of the things that makes children come and read in the library so often. The library is also very attractive. There are print-rich materials made by students on display, the floors are also covered with rug so that they can sit on the carpet. On one wall, a schedule of library period was affixed. So exciting. 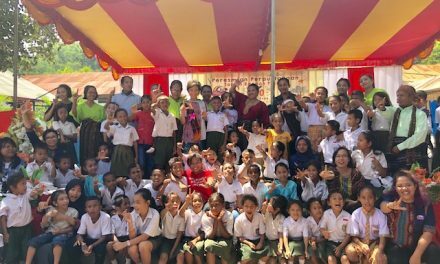 We also visited SDN 01 Labuan Diri. The Principal is Bpk. Ismail. He was just assigned to be the new principal at the school. 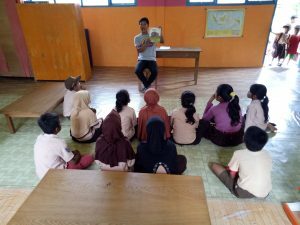 Activities in the SDN 01 Labuan Diri library are almost the same as at SDN 01 Sumber Sari. In addition to visits during breaks, reading activities are also conducted by teachers and there is a schedule for each class. Each class gets a one period for each week or about 35 minutes. Reading activities that are often carried out are reading aloud, shared reading, paired reading and independent reading. Hopefully, with the presence of the Rainbow Reading Gardens library, children of patchouli farmers in Siontapina can receive fruitful benefits.